After both New York and Minnesota pulled starters early, the superior staff of relievers dominated Tuesday night. NEW YORK — “We knew the phone might ring early,” said Yankees reliever Chad Green. In the do-or-die AL Wild Card Game between the Yankees and Twins, neither manager could afford to sit on his hands while his starting pitcher struggled. But with both Luis Severino and Ervin Santana getting into trouble early, the battle of the bullpens was a mismatch. New York’s deep relief corps paid huge dividends, as Green, David Robertson, Tommy Kahnle and Aroldis Chapman combined for 8⅔ innings of stellar relief work while the Yankees lineup overcame a three-run deficit and pulled away for an 8-4 victory—their first postseason win since 2012. Entering the game, the Yankees’ clearest advantage over the Twins appeared to be in the bullpen, where manager Joe Girardi could bridge the gap between Severino and closer Aroldis Chapman by calling upon a quartet of hard-throwing relievers, four of the majors’ nine who whiffed at least 37% of the hitters they faced this year in Green, Robertson, Kahnle and Dellin Betances. The unit as a whole struck out an MLB-best 29.1% of hitters while yielding a 3.34 ERA, third best. The Twins, on the other hand, needed length from Santana to cover for a bullpen that finished with the majors’ second-lowest strikeout rate (19.8%) and the AL’s fourth-worst ERA (4.40). 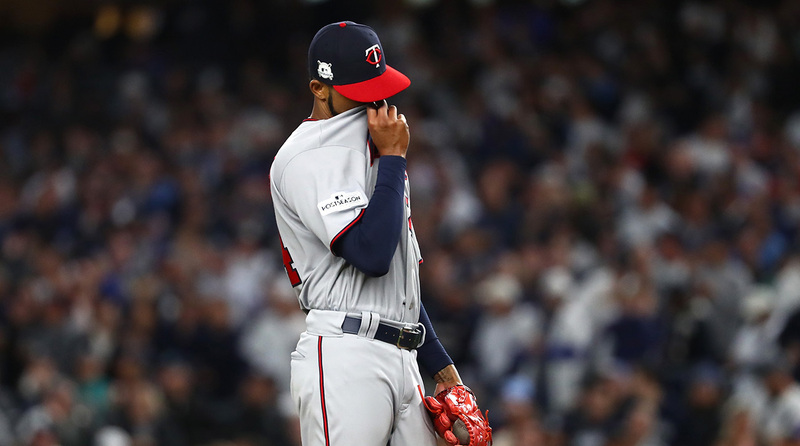 While remade for the stretch run—after the Twins traded closer Brandon Kintzler to the Nationals, at a point when the team was 50-53—their bullpen lacked anything close to the firepower of their opponents. If Girardi hadn’t figured to need 26 outs from his bullpen on this night—which he did, given the 3-0 hole that Severino dug in the first inning—general manager Brian Cashman had at least built for it, acquiring Robertson and Kahnle from the White Sox on July 19 to augment the late-game tandem of Betances and Chapman and to replace flagging Tyler Clippard. The 23-year-old Severino, though one of the AL’s best starters this year, was jacked up on adrenaline to the point that his first pitch was clocked at 99 mph, and he lacked his usual command. After he served up first-inning homers to Brian Dozier and Eddie Rosario and put runners on second and third while retiring just one of six batters, Girardi went for the hook, knowing that he wouldn’t run out of high-quality arms, particularly with 10 pitchers on his roster for the night. On came Green, a 26-year-old righty who whiffed an even 100 hitters in 67 innings of relief work this year; his 41% strikeout rate ranked third behind only the game’s two elite closers, Craig Kimbrel and Kenley Jansen. Where a hit could have given the Twins a 5-0 lead, Green instead saved the Yankees’ bacon by striking out both Byron Buxton and Jason Castro on 96 and 97 mph fastballs, respectively. The strikeouts sent the crowd of 49,280 into a frenzy that continued into the bottom of the first, when the Yankees worked deep counts against Santana. Leadoff hitter Brett Gardner worked a six-pitch walk, Aaron Judge singled on the seventh pitch of his at-bat, and after Gary Sanchez popped out, Didi Gregirius won a six-pitch battle with a game-tying three-run homer to rightfield—suddenly, a whole new ballgame. Santana’s 42-pitch first inning forced Twins manager Paul Molitor to warm up Jose Berrios—a starter with the Twins’ best arm, but with just one major league relief appearance to his name—and 27-year-old rookie Alan Busenitz (who?). After Green mowed down the Twins in the second inning, Molitor, with far less confidence in his options, rode Santana for another frame, during which Gardner hit a fastball 393 feet into the second deck of rightfield for a 4-3 lead. When Green faltered in the third inning as his pitch count approached and then surpassed 40, loading the bases while retiring just one batter, Girardi had the luxury of calling upon Robertson, the owner of 132 career saves. The high-socked prodigal son, who spent 2008-14 with the Yankees and was a vital part of their 2009 championship, had assumed an Andrew Miller-like role upon returning, getting big outs as early as the fifth inning and flat-out dominating via a post-trade 1.04 ERA. His extrication job wasn’t quite as clean as Green’s. He induced a grounder that would have been a routine double-play off the bat of any runner slower than Buxton, but the speedster beat the throw, and Jorge Polanco, whose leadoff single had sparked the rally, scored the tying run. The Yankees quickly retook the lead against the 23-year-old Berrios, who made a couple mistakes, surrendering a double to Sanchez and an RBI single to Greg Bird. In the fourth, he allowed a two-run homer to Judge, putting the Twins in a 7-4 hole. Robertson kept the Twins scoreless into the sixth via a 3⅓-inning, 52-pitch effort, the longest of his major league career by both counts (“I think Double A in 2008,” he said when asked if he’d ever pitched longer). He scattered three hits and a walk while striking out five, generating 12 swings and misses. “The hitters are geared up for a fastball. So for me, I have to be a little sneaker and I have to put a little more break in the ball and try to be smart and selective with my pitches,” said the 32-year-old righty. By the time Robertson left, the game was more than two and a half hours old, the Yankees had a three-run lead, and Girardi still had plenty of arms to get them the rest of the way. But when the Yankees manager called upon Kahnle to face Joe Mauer, representing the tying run after a Dozier double, the Twins actually had a mismatch in their favor, as Kahnle struggled to get lefties out this year (.309/.360/.370), and the Yankees bullpen had southpaws Chasen Shreve and even CC Sabathia available. Mauer hit his second pitch into the leftfield corner, but Gardner ran it down before it could cause trouble. Kahnle ended up with the cleanest sheet of any Yankees reliever for the night, retiring all seven hitters he faced to take the Yankees to the ninth. “We knew once those doors opened up that it was going to be tough to score,” said Molitor, who did his best to keep the Twins within striking distance. Alas, their inexperienced and largely unknown group of relievers—Trevor Hildenberger, Taylor Rogers and Busenitz—surrendered a seventh-inning run via three walks (one intentional) and a single. When Chapman came on for the ninth inning, it wasn’t even a save situation, though the Cuban fireballer pitched like it was one, dialing it up as high as 103 mph and working around a two-out Mauer single to strike out the side.